If the late James Brown was the hardest man working in show business, I nominate Joji Shimamoto as Japan’s hardest working man in the photography business. Joji grew up in Japan and went to art university in San Francisco. When he was in the US, he had shows in New York and San Francisco and developed a following among young skateboarders and the club crowd. I first met him a few years ago when he had just returned here to Tokyo and was having a show at the Artcomplex Center of Tokyo. I was there to see other artists’ works in the building, and prior to seeing Joji’s work, had no interest in exhibiting photography. He had more than 50 photos in this show and many were of the street and party scenes of San Francisco and New York. I think they were all black and white, and I liked them right away. He had photos of the homeless, abandoned buildings, skateboarders, beautiful women, bars, store fronts, etc. I thought there was something very interesting about his work and the photos stimulated my imagination. It wasn’t that the images were beautiful. In fact, some you wouldn’t ever call pretty. But each of them had a story and in the words of my partner, Hitoshi, they had a ‘smell’ too. You could almost feel the air and the temperature in the photos. I bought one on the spot, and when he delivered it to my gallery a few weeks later, we decided to work together more. Since then, we’ve had his shows at the gallery and always have a few of his works on hand to show to clients. But it would be wrong to think Joji only does the street scene. Indeed, many of his photos are of the streets and they appeal to younger people—but he has other photographs of sunrises, sunsets, city scenes, and famous buildings, such as Duomo in Italy, that are just as interesting. His works are in many homes and offices and they have universal appeal. I’m no skateboarder, but I like the energy and the power of his skateboarding works too. I am also a big fan of Joji’s work of the quickly disappearing old Japan, like his excellent photograph of the almost extinct ‘pink phone,’ or old neighbourhoods. Even his photographs of telephone and electric wires are compelling, and there’s often an element of surprise and discovery in his work. The shuttered storefront with all of the graffiti appears abandoned and desolate but after looking many times, you notice that there’s a skateboarder far on the right. You can make out a small cat in some of his photos of buildings. Some of Joji’s works that I’ve bought for my own collection are of famous singers or clubs, but I only found out who the subjects were after my friends pointed that out. He doesn’t look for famous people. He looks for interesting subjects. Joji has already produced several books of photographs and they’ve all sold out. He did the design and the marketing of these books too. And he’s managed to do this while also taking the photos, developing his craft, answering inquiries from clients, working full-time in a skateboard shop and participating in numerous group shows. 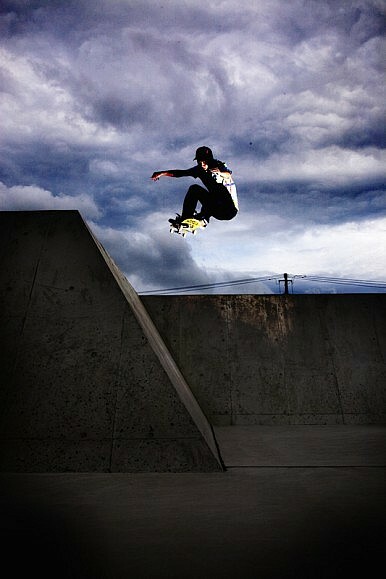 He also travels around Japan shooting for Adidas, Volcom and other brands. Joji travels a lot—to places like Taiwan, Hong Kong, America, Italy and Portugal—for fun and to take photos. And this summer, Joji and his work seem to be everywhere in Japan. It’s great to see that his hard work is paying off and to see him and his work gaining in recognition. But the main reason you can see his work everywhere is that he has now published his seventh book of photographs. It’s a beautiful limited edition large format book that has more than 40 photographs from Tokyo, Osaka, Hong Kong and Vietnam. It’s a Joji Shimamoto ‘sampler’ that he has worked on for the past three months, and while it’s mostly ‘street,’ you can also see his considerable talents applied to the tenement buildings of Hong Kong, early mornings in Tokyo, police gatherings and the streets of Vietnam. Joji launched the book at a party he planned earlier in July and more than 100 people attended. The book is available at many good bookshops around Japan and it’s in our gallery now too. It’s good, but when you see the actual images printed by this talented and hardworking artist, you’ll see why we consider his future to be exceptionally bright.